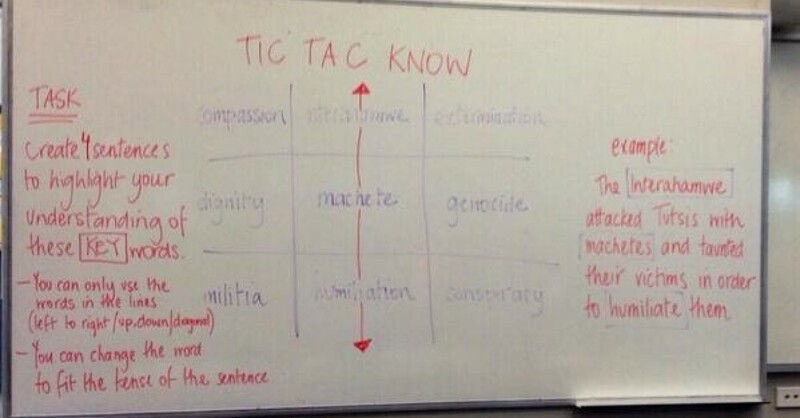 Great idea by @sallyluane: ‘Tic Tac Know’: Write a grid of keywords. Each student gets a point for each sentence they construct using all the words in a particular horizontal / vertical / diagonal line. Get the students to decide upon the words. If more than one student opts for the same line, listen to all of them and then the class votes on which one is the best. Points can be cashed in as sweets at the end of the lesson. For added difficulty insist that the words have to be used in the sentence in the order they appear on the grid (students can choose the direction of the arrow with which they join the words together).